Edna Ferber was one of the best selling female novelists of the 20th century, author of novels and plays from the 1910s to the 1960s. Her best-known books include Show Boat, basis for the perennial play; the Pulitzer Prize-winning maternal saga So Big; and Cimarron, a tale of the Oklahoma land rush. Her stories were usually about ordinary Americans, but frequently dealt with major issues, and her novels and plays have been adapted to make more than two dozen movies, most notably the sprawling modern western Giant, starring James Dean, Rock Hudson, and Elizabeth Taylor. Ferber started as a reporter, then wrote her first fiction while recovering from anemia. 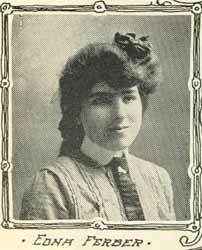 Her first fame came from a series of short stories -- later novels -- about Emma McChesney, a traveling saleswoman. Her first play, Our Mrs. McChesney, recounted some of those stories, and was produced on Broadway with Ethel Barrymore in the lead. For the stage, Ferber frequently collaborated with George S. Kaufman, perhaps to best effect with Dinner at Eight. A regular at Dorothy Parker's Algonquin Round Table, she was known for acid-tongued but usually good-natured barbs, including a famous encounter with playwright Noel Coward. Commenting on the masculine cut of her suit, he said she looked almost like a man, to which she replied, "So do you." She was never known to have had a romance with anyone of either gender. H. L. Phillips quoting Elmer Twitchell, "The Once Over", The Evening Day (New London, CT daily newspaper), 18 October 1952: "Once an author in the $600,000 class gets into the White House, you open the way to the presidency for Somerset Maugham, Ernest Hemingway, John Steinbeck, and all other best-seller writers. It could lead to the Republicans nominating Fannie Hurst and the Democrats putting up Edna Ferber to save America."